Yelchenko vowed continued pressure on Russia to ensure the release of Ukrainians. Ukraine has handed UN Secretary-General Antonio Guterres a "Kremlin prisoners list", Ukraine's UN ambassador Volodymyr Yelchenko has said. "I had a touching telephone conversation with Valentyn Karpyuk, the brother of political prisoner Mykola Karpyuk, who is serving an illegal sentence in the Russian Federation. 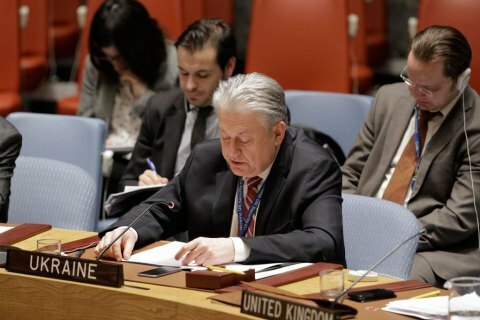 He's one of those on the list of Kremlin's prisoners, which we just handed over to the UN Secretary-General," Yelchenko tweeted. "We are doing everything possible toward his release," the diplomat said. The pressure on Russia must continue "to free our people! ", he said. Earlier, over 30 countries issued a joint statement urging Guterres to raise the issue of political prisoners with President Vladimir Putin when he travels to Russia for the World Cup.